Imagine that procrastination is a person...very similar to the time snatcher, on my other page. They will be the person with too much time on their hands because they have stolen everyone else’s. They have the knack of making us leave the jobs that need to be done...they leave us feeling lazy but that isn’t the case. Well one day Procrastination knocked on the door at our home for waifs and strays. I didn’t check to see his/her credentials because I didn’t think it was necessary, so I let them in without further ado. It was much later when I realised they were still there, taking control of the house...that was a big mistake! The household chores piled up and our home for waifs and strays went into decline. My characters in the computer could be heard calling, from as far away as the pond. It was no-one else's fault but my own. During the Procrastination's visit, I seemed drained of all energy...and after they left, I couldn’t be bothered to do half the things I would normally have done. I blamed it on the weather, anything that would make me feel better for not doing the work that needed doing. My dear and unassuming husband could not understand what had happened to me when he arrived home later that day. I didn’t understand it myself at the time and now that I do, it’s only fair that I should warn you. Procrastination is not invisible like you would have thought, quite the opposite. That is why it is easy to let them into our homes.....they are people...real people.....just like YOU and ME! They are YOU and ME! We are all guilty of being friends with Procrastination and being Procrastination ourselves...and that is fine. But what you have to watch for is how much of your time you give to them. 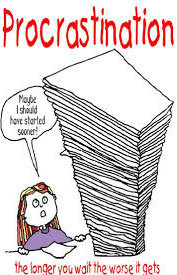 It is so easy to say...just one more cup of tea...just one more little chat...just a little bit of this and a little bit of that...but ‘ just one more ‘ is Procrastination’s assistant. It is up to you how you will deal with Procrastination and his/her assistant, but bear in mind that those all important dreams you have, need time, just as those all important jobs that need doing, need time. And there is only so much time to go around. Don’t spread yourself too thin. I have a friend who has done exactly that and now it’s going to take some time to fatten them up again. And just one final word.....There is also a time when we all need friends like Procrastination and his/her assistant..... Just keep an eye on your watch! Goodnight!